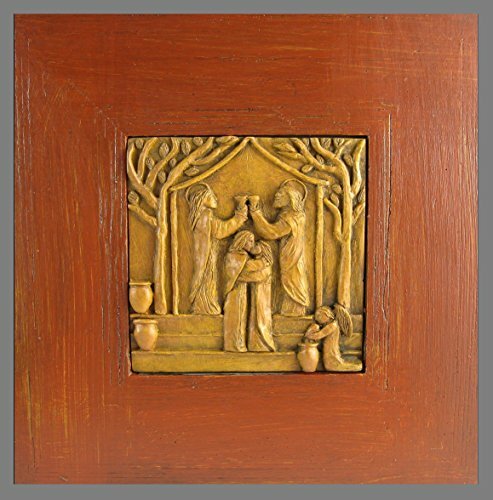 The entire piece is handmade: I designed and carved the tile/tableau, cast it in modified gypsum with metal powders; I then set the tile in the frame, which is also handmade. The frame is made of modified gypsum and is hand painted. The piece has a hook on the back and is meant to hang. It comes boxed with a history card and the history is also given on a label affixed to the back of the piece. The history card states: "The story of the wedding at Cana: Mary is at the wedding when wine runs out. She sees Jesus and the disciples coming and tells him the predicament. Jesus then changes vats of water into wine, a wine far better than that served earlier at the wedding. The story shows both a blessing on a wedding and marriage and also Jesus' emphasis on the joy of the wedding and the life of love that follows. The piece was handmade by Hank and Karen Schlau at In the Company of Saints in Natchez, MS." Dimensions of frame: 8.25 in. x 8.25 in.